Knowing I’d be presenting on October 9th made it immediately clear I needed to test on the Friday before (7th) and the Monday following (10th). This should reflect the shift in LDL-C and HDL-C, given they both follow that three day window immediately before a blood test. But what about LDL-P, and for that matter, small LDL-P (smLDL-P)? Since these follow a three day window, but with a two day gap in between, I needed to be sure I captured all five days before Oct 7th and the five days following. So in short, I’d be on the “low calorie diet” on October 2nd, 3rd, 4th, 5th, 6th until the morning of the 7th (Sunday, Monday, Tuesday, Wednesday, Thursday). I’d then take the blood test and ramp up the food intake to a “high calorie diet” for the rest of the 7th, then the 8th, 9th, 10th, and 11th (Friday, Saturday, Sunday, Monday, Tuesday) up to the morning of the 12th. Below, in each graph, I mark the blood test associated with these four tests over the ten days in red, which will always be at the right of the graph. 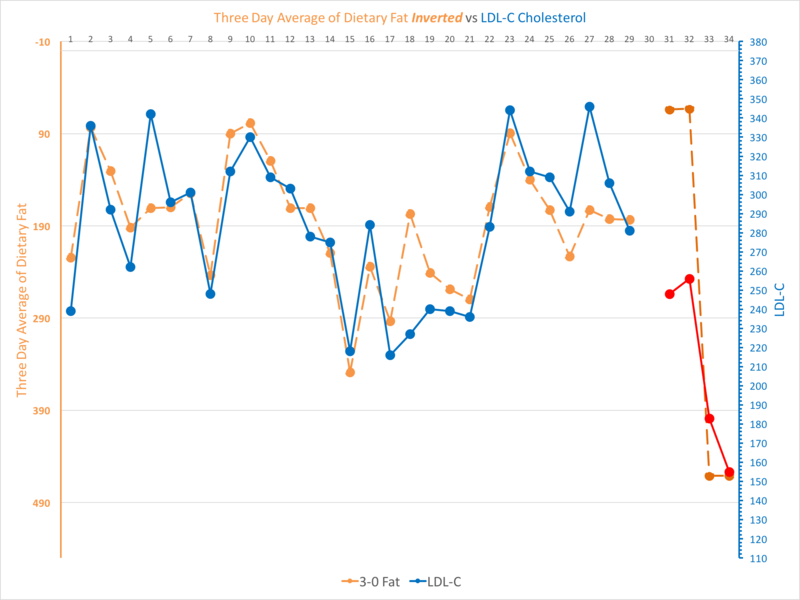 So let’s start by looking at our old friend, LDL-C.
For those of you who regularly read my blog, this is a familiar graph. In this case the blue solid line represents the LDL cholesterol that resulted from the blood test. The dashed orange line represents the dietary fat I ate in the three days just before the blood test was taken. At the far right end you’ll see a solid red line replacing the blue. Those four data points took place October 5th, 7th, 10th, and 12th. You can also see the dashed orange lines showing my extreme low, followed by the extreme high in dietary fat. Let’s invert the axis on the left side of the graph (the Three Day Dietary Fat) so that we can compare these trends visually. Sure enough — I “broke” my own correlation given how quickly I shifted from one extreme to the other. Given our correlation on the left side of the graph, you’d expect my extreme low on dietary fat of 63g would theoretically push my LDL-C up to around 348. However, I did manage to bring the LDL-C down to 155 which did match the expected position relative to the diet. Yet this completed on the 12th, not the 10th. Again, this was probably due to the degree of shift, but we’d need to do more testing to know. Like LDL-C above, the massive shifts seem to surpass my metabolism’s attempt to catch up. 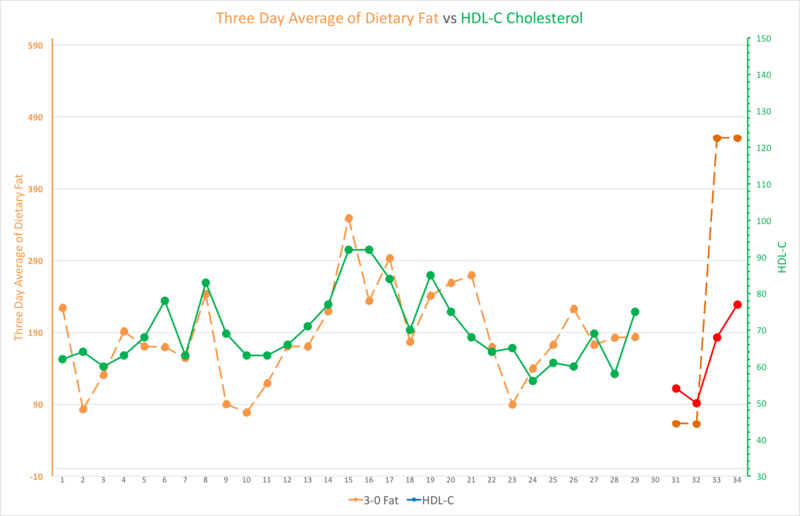 Now let’s look at HDL-C.
As you can see from the green line on the right side, we have a long established coupling in the positive between dietary fat and HDL-C. But this too is broken by the experiment as shown on the right. I had a number of things change, but there are two specific ones I wanted to call attention to in this post. Whoa — really?!? 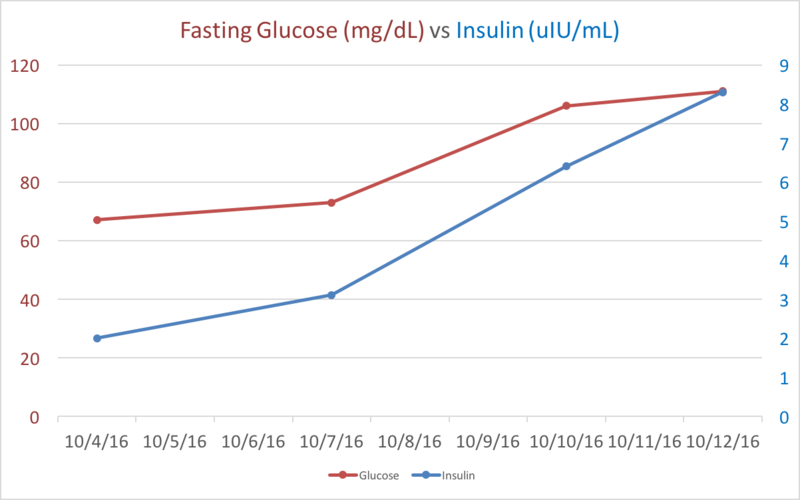 As my fasting glucose went up, so too did my insulin? No way! Okay, kidding aside, it’s difficult to tease out the impact of each macronutrient on my fasting glucose to see what the primary drivers of the increased insulin were. Since all of my macros went up, this could’ve been from higher carbs or protein — or possibly just overall caloric load. What is interesting is that even after 5 days at 5000 calories, my peak insulin was still at the bottom third of the reference range, at 8.3. Incredible! Easily one of the most hotly debated subjects in low carb communities. I’m firmly in the camp that says Hormone Balance Matters Most, But Calories Are Still Energy. Is that a side? If so, should we start a website for hbmmbcase.com? I’m 6’3″ (190.5 cm) and thus feel a bit underweight at my running average of around 176 lbs (79.8 kg). My typical average calories right now are around 3,100. So what happens when I drop it to 750-ish for five days, then ramp up to 5,000+ for five days? I’m missing 10/2 and 10/3 due to not being around a scale (was on a camping trip), but presumably I had a similar trend as 10/4-7 given I hover around 176 lbs as mentioned above. 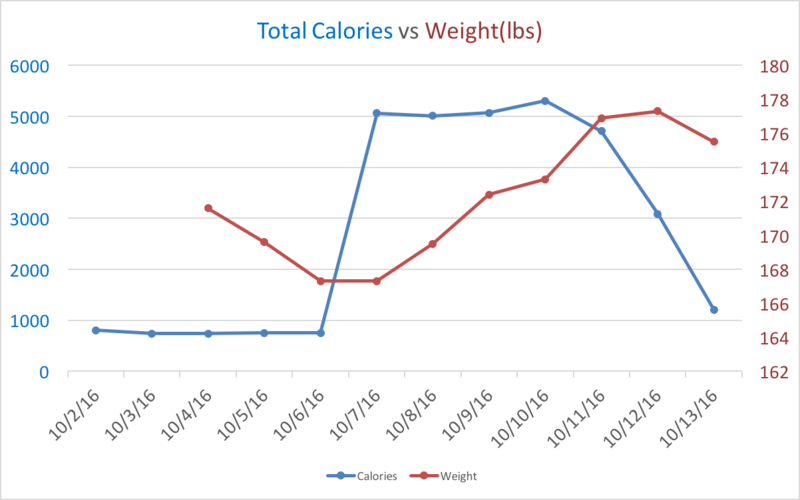 Clearly the massive drop, then rise, in calories had a very acute effect on my weight. Over this span of time, I was careful to keep my water intake roughly the same for both low and high periods, although my non-water beverages were a little higher on the last half. I’m now at the point of being so sure about the dynamism of the lipid system that this is becoming almost comical. Getting to this point took a lot of money, time, and blood (literally). I was fortunate to have this experiment wrapped into my first presentation. Doing the demonstration was a no-brainer. Why only show the data if you can display its predictive power as well? There’s actually a lot more data I couldn’t get to due to the balancing act I’m now performing between this, contract work, interviews, and helping others to gather N=1 data as well (upcoming). In all seriousness we apoe4/hyperresponders need answers – is high LDL -P and small LDL-p harmful in the context of LCHF/Keto with low inflammation and low FBG and low insulin?? >> Nice work! I suggest quitting your day job and staring a “go fund me” or “kickstarter” campaign! I will make the first contribution. – Thank you, Richard. I’ve heard this suggestion from enough people that I’m considering it strongly now. >> In all seriousness we apoe4/hyperresponders need answers – is high LDL -P and small LDL-p harmful in the context of LCHF/Keto with low inflammation and low FBG and low insulin?? – I wish I knew the answer to that. But FWIW, I’m technically an excellent candidate for finding out given I don’t drink / smoke / do drugs / yet get exercise, etc and had no major metabolic derangements before starting the diet. Yet I have very high cholesterol numbers after going low carb (feeling better than I ever have in my life) and take no steps to lower my cholesterol. I’m very actively studying a host of markers on myself such as CAC and CIMT as well as all the blood work and will report what happens, good or bad. This is a journey of discovery, not advocacy. Obviously, I’m of the opinion that low inflammation and oxidative stress is far more important than almost everything, and currently operate as such until or if the markers change to show otherwise. Dave, A quick suggestion is definitely start fasting… That has given me the best response of anything..
My first fast was four days and then followed on with 18/6. 2 meals a day 3 days a week, and 22/2 One meal a day for 4 days.. randomly depending on schedules and social activities. However LPa has stayed stubbornly high as has ldl-P …. I have read that APOE4 perform much better with regular fasts and as a group the handle that very well.. Which certainly aligns with my experience.. Interesting — I haven’t yet done fasting so as to do it in isolation for my testing. It will likely be its own experiment. I’ve read in many places that Lp(a) is often genetically determined and is thus hard to move. What is your score currently? Also, do you know what it was before your heart event? Your presentation in LV was superb. I agree with Richard, the research is so interesting that there might be no harm in you opening a campaign to test out a market for community-funded research. I can think of a number of different approaches to monetise the research, testing, results, software, education materials…. I’ll likely have something up soon. I’ve just come across your blog and am finding it very exciting. I’m a 36 year old woman who has been on a ‘zero’ carb diet for 18 months, by which I mean I eat meat, eggs, a little cheese and lots of double cream. I drink coffee and (very occasionally) a little alcohol. I’ve seen extraordinary changes in body composition, mood, cognitive function, libido and energy levels – I seem to have gained muscle mass and dropped fat with very little effort. I’ve also completely lost any cravings for carbs. Previously I was overweight, pre-diabetic, depressed and had a long history of disordered eating. It’s been truly transformative. Obviously, though, everyone thinks I’m mad, including my GP. I had my cholesterol measured about six months ago. Unfortunately I’ve lost the results but they were high enough for my doctor to write requesting I made an urgent appointment. She tried to put me on a low fat diet and seemed not to be able to see the woman in front of her, only the numbers. – Am I welcome to contribute here as a ‘zero’ carber? – Do you write about what you eat in detail anywhere? – Any thoughts on where to test cholesterol privately in the U.K.? I’m actually going to put up a blog post soon just for women with high cholesterol after going low carb. In my research there’s much less doubt for females over males of high cholesterol being inverse to all cause mortality (more cholesterol = less chance of dying from anything). I often joke now that I’m glad I wasn’t a woman or I would have long abandoned my research given how much evidence they have that’s surprisingly compelling by comparison. > Am I welcome to contribute here as a ‘zero’ carber? Please! If you are doing in blood tests in the future, please closely record as much as you can with your diet up to these tests and share. Feel free to use my “Food Logging Protocol” (see link in menu above) for effective accuracy. > Do you write about what you eat in detail anywhere? 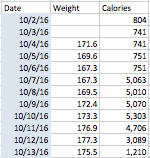 Yes, MyFitnessPal (for now), but I sometimes update it in chunks. You can friend my username, DaveKeto. > Any thoughts on where to test cholesterol privately in the U.K.? Not sure… you might want to reach out to Ivor Cummins. He’s based in Ireland, but is familiar with UK testing, I believe. Fantastic, I look forward to reading it. I hear what you’re saying about the evidence base regarding the protective effects of cholesterol in women, although I’d note that this has in no way seeped through into public consciousness. Add in the fact that I’ve made the choice no to eat fruit or vegetables of any sort at present and the pressure from family and health professionals intensifies. My GP is waiting for me to develop scurvy as well as heart disease, and no one believes that constipation isn’t an issue with no fibre. I’ve looked through your food recording protocol and will certainly follow it if/when I have my levels tested again. How far in advance of a test should I start logging? You should start logging by at least the 5 days before your first blood test, given the LDLp Inversion pattern appears to work that far backwards. I’d like to see if I can replicate your results on myself. In Jan. 2017, I intend to run pretty much the same set up as you did with two exceptions/questions. 1. I’m 5’11” tall, weigh 240 lbs and am around 31% BF. What would you recommend for low and high calorie targets? 2. I intend to plan out the amount of saturated fat, polyunsaturated and monounsaturated fat consumed. What were your protein, fat, carb ratios during your testing? Thanks for doing all of this. I believe I also am a hyper-responder as I’ve clocked in as low as 1100 LDL-P and as high as 2,300 LDL-P. I’ve also gone from below 200 total to above 300 total before. – 1 – The high and low calorie targets should be as low as you can stand to as high as you can stand. For me it was 750 on the low, 5000 on the high. It could be that I could’ve gone lower and higher, respectively, but it did feel like I was near my limits on both sides. – 2 – It was generally 75% fat / 20% protein / 5% net carbs, but I’ll come back and give a more precise breakdown once I’m in my spreadsheets again. Just got around to replying. I completed the tests and am just trying to figure out how best to put them together. Any suggestions on the best way to share? I’ll email you directly at the address you gave when registering with this site for comments. However, I may not be able to get to it until next week as I’m a bit swamped at the moment. But fascinated by the whole cholesterol story. I’m still instructing my patients to take statins and stay on a diet. BUT, I want to change that. I put more time in talking to my patients about low-carb and effect on CV risk. But I need “proof” to suddenly change my “old” story to a complete new one. So I want to be your next N=1. I want to do this to convince my colleague and my trainee that the whole cholesterol story is WRONG. I’m planning to do the experiment without telling them what I’m doing nor telling them what we are looking for in the blood samples. Just revealing everything when it’s done. Can you help me with that? I would be happy to share all data with you. Please contact me. Go ahead and outline what you have in mind. Are you going to do the same experiment as this post? I want to do the exact same experiment. But I want to be sure I do it right. I’m 68Kg 1m67. So not lean (yet). As an MD I have free blood-testing. So I can test anything the lab I work with can test. Even every day, because my trainee can draw the blood. So which test would be important. I’ll copy everything you are showing in your posts (if possible). But I need to know how to get the diet right in both fases of the test. Just low carb en low calorie en switch to low carb en a lot of calories (mostly fat). Is it that simple? Or are there things to watch out for? Perfect. I’ll wait until the guide is ready. And thank you for doing all the hard work. Great info! Question: As someone that has some very good markers (HDL 90, Trigs 70) but very bad LDL-P #’s, I’m curious: did your LDL-P/particle size #’s return to their pre-experiment levels? i.e. how long does the drastic improvement in particle size and count last? It is acting in some way as a “Reset button” or do the numbers quickly return to their pre-5000 calorie LCHF diet levels? I assume they quickly return — or rather, as “quickly” as I got them there given the 3 and 5 day patterns with LDLc and LDLp, respectively. Thanks so much. Did you investigate triglycerides? The longer I follow LCHF, the higher my LDL and TG. Both are now off the charts high. My GP (LCHF advocate) is completely bamboozled. Seth, I have had the same problem.. With disastrous health results… Dr William Davis says the first thing you need is a genetic test to establish which Gene type you are..Dr Steven Gundrey agrees.. If you are an APOE3/4 or 4/4 this approach daren’t work. From both these Doctors comments found after much searching of the internet, snippets here and there.. I have embarked on a new strategy…. I will post a link to GUNDRYs utube with most concise information on APOE4 dietary needs for healthy Cholesterol Metabolism. NO SAT and very little meat, chicken. VEGIES, As much low carb Lectin free vegetable as you can eat… That means GREENS. SEAFOOD, Oysters, clams, mussels, crab Pilchards Sardines ….Limited Fish Shrimp Squid Octopus. DAIRY is banned , if you need to eat dairy make sure it’s Goats or Sheep fermented like cheese or Yoghurt. – I’m an ApoE3/4, but do not have higher TG. – Just for context: by “healthy Cholesterol Metabolism” — do you mean lower LDLc/p, lower TG, or both? Somehow I missed your comment from earlier, my apologies. LDL going up isn’t as concerning for me as much as TG. High TG, like high glucose is probably a sign of dysregulation and suggests an overage in energy metabolism. Anecdotally, I find it comes more with people who “cycle” on and off LCHF allowing for more carb meals intermittently. You might want to consider doing a very detailed and careful log of your food for at least a few weeks. Look for leaks that take your carb count much higher then you might have thought. And have you been actively losing weight to this point? Fascinating work. 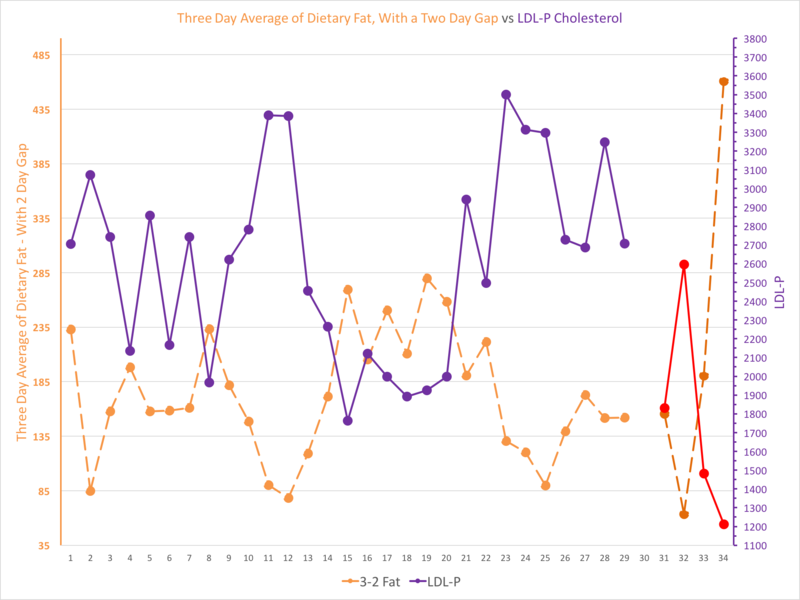 I am a bit confused however, what is your scientific reasoning for using the “2 day gap 3 day Look backr” as an accurate measure for LDL-P? Why not just last 5 days? Why is a diet, 2 days before the test not move the needle in LDL-P? Not a scientific reasoning, just the strongest emerging correlation I’m getting with the bloodwork. 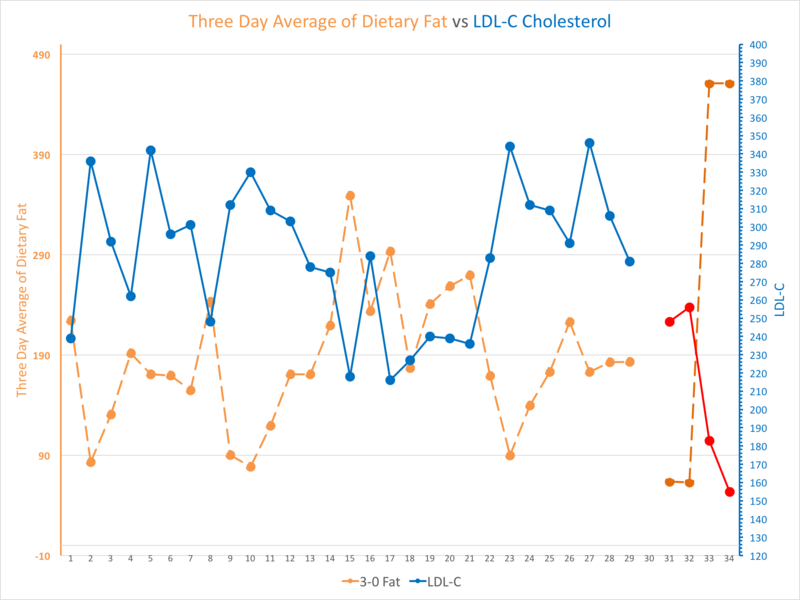 I was originally trying to apply the same 3 day average to LDL-P as I have with LDL-C but it was showing a consistent delay of two days as shown in the weeklong, day-after-day blood testing. Once adjusted to include the gap, the Pearson showed the strongest correlation with that formula (currently -0.83). I have taken around a dozen NMR tests over the last 3 years. 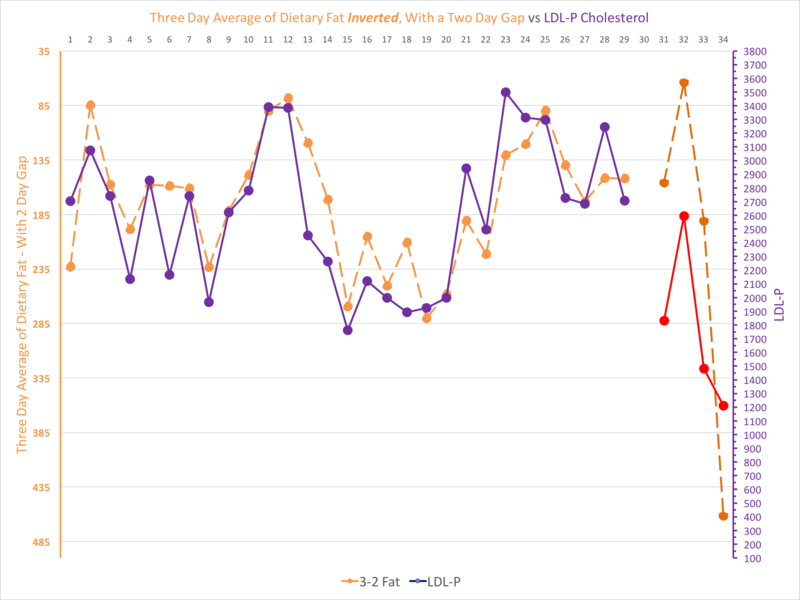 Here is how my Pearson correlation looks like for LDL-P using your 2 day gap 3 day look back. I am APOE4/3. It looks like Mono is good, Animal protein (cholesterol) bad. Pretty much on point of what Dr. Gundry has suggested would happen. Have you ever tried using the sdLDL tests? You applied Pearson along all NMR data sets along with your record of food… but if so, it makes the % and fat line items a bit more confusing. Could you clarify a bit more? % fat has a negative correlation to LDL-P. However if you break down the fat more granular, it’s the Mono Fat that really moves the needle. The % for Fat, Carbs and Protein is simply a percentage taken over the 3 days. (All add up to 100% per day). It’s probably not the most accurate number to look at. Overall Protein, Cholesterol and Mono Fat seem to influence my LDL-P the most. I absolutely love your blog, thank you! I realize your not a doctor but I wonder what you recommend for my situation. I have been treated for high TC since my 20s and I am now in by early 50s. I have been on at least four different medications and varying dosages. However, I am still having issues with the LDL-P values which are in the 2,000s. Way too high. I eat mostly vegan and low carb, nothing is really working to bring down the ldl-p value. The best I achieved was an ldl-p of 1,100 when I ate totally vegan and no added fat for 6 plus weeks. I often thought about increasing the good fats in my diet since I don;t get much but not sure I know how. Thanks! I’m not surprised you’ve found a low fat, vegan diet to bring your LDL-P values down to near 1,100. Many people don’t realize that I often speculate I’d likewise bring my LDL-C and LDL-P values down if I went toward a plant-based, low fat diet. But then, I’m not as convinced high LDL-C/P values are a net negative for risk with all cause mortality. If you derive more energy from fat, you should know the majority of it is carried to your cells in low density lipoproteins (LDL-P) in the form of triglycerides (Trigs). For more on this, see my Simple Guide to Cholesterol series here and here. Given my research/data to date, there appears to be a “Preference Point” as to how many of these LDL-Ps the body wants to maintain in the bloodstream, and for both you and I it is considered “high” as hyper-responders. So again, if you’re more concerned about the risk of these LDL-Ps being in your bloodstream in the first place, you may prefer to avoid fat as a primary fuel source and instead lean toward carbs. Just know that avoiding fat and pumping up the carbs can have potentially terrible consequences as well (which gets covered extensively in the low carb community). Obviously I don’t share the same assessment of risk at this time and thus take no steps to lower my cholesterol. (Beyond my testing the Inversion Pattern directly, of course). Hi Dave – thank you so much for all you write, and for the experimenting you are doing. It’s all very exciting, and yet so worrying that tthat we seem to have been so wrong for so long too. I’m a 60 year old female, weighing 52kg.I live in New Zealand. I have never been particularly over weight, although I have lost 4kg over two years, and can now easily maintain my current weight. I have chosen the LCHF life style because of the general health benefits I have read about, and also to stop that slow gradual weight increase that women can suffer at my age. I have experimented a lot with different amounts of various foods, from within the LCHF groups, over the last 4 years. I feel fit, well and healthy eating this way. I have retained muscle mass. It’s become just what I do – sugar and carbs are pretty much a thing of the past. I have thought that that reading may have been from my lack of exercise (which I have neglected for the last 12 months – I’m usually very active at the gym and with hiking). I have also had a very stressful job for the last 9 months (I have resigned that as of today 14/12/17). I had also had a bowel infection just prior to the 10.6 cholesterol result. However, today 14/12/17, my next blood test came back at 9.9. While I have been fairly strict with my diet, I have not been completely carb free. I have worked out that I do not do so well on dairy products. I seem to put weight on with them. My mother had always had cholesterol of about 8. She eats LCHF too (she’s 88 and has lost 5kg) but her doctor has scared her into taking statins. My doctor is now really pushing for me to take statins. I will not do this. I am supposed to have another cholesterol test on March 14. After reading your information about getting cholesterol down before testing, I’m going to follow your food protocol recording, and try the 3 day high calorie eating leading up to the test. Do you think that this is the best one to follow at this stage? Is there a food plan anywhere that can be followed for the 3 days, or do I just eat until the requirements are met?? I will be most happy to share my results with your community. Thank you again for the time you take to write and share all you are discovering. – Yes — I’m very familiar with the LCHC Shock (which I now call it): Low Carb High Cholesterol. Often, like myself, you just can’t believe it’s actually real given how wonderful and balanced you feel. 3) I don’t have a lot of research on having carbs occasionally with fat, but anecdotally, I *really* don’t like what I’m finding. High carb, high fat is already a bad combination. But when steadying your body on LCHF for a while, then blasting it with a big “cheat” meal can be pretty problematic given how much it adjusts to the other pathway. This is why I always tell my family that I’d rather they cheat a little over a day than all at once in a single meal. – I’d love for you to follow my protocol and share about the results. There’s not a specific food plan to follow, just be sure the food you eat lands inside a ketogenic/LCHF ratio for all three days. As with most people I talk with here, it’s important to figure out for yourself if having higher cholesterol while all other markers are great is of concern for you. After what both my research and data has shown me, I’m less concerned (but not *un*concerned) and thus take no steps to lower my cholesterol even though I’m a hyperresponder like yourself (and apparently your mother). – One more aside — I often joke that I’d have abandoned doing any research a long time ago had I been a woman when I started. I’ve come across so much data that shows a lower all cause mortality for women the higher their cholesterol they have. I really can’t thank you enough for this prompt reply to my message. I can only imagine how incredibly busy you are, and so I am doubly apprecaitive for your reply. As you put it, I feel less concerned with what I’m doing, and more so after following some of these links you have shown me. I’m also interested in the ‘big break out’ of a carb binge. This could well describe me, on occasion, and I have to say, I do not feel well afterwards (and that’s not a downer from breaking out) – it’s hard to describe the physical feeling, but it doesn’t feel good at all. I’ll certainly let you know how I get on with the 3 days before the next blood test – it’ll be very interesting. It sounds to have been another wonderfull conference that you attended. I look forward to hearing more about it as the presentations become available. I also look forward to your next findings. – I have a general rule of thumb that I say to many people, including my family: Don’t do a “cheat meal” that is more carbs than you would have had over an entire day while on diet. So if you are keeping at, say, 25g of carbs or less on almost every day — don’t have a meal that is over 25g of carbs in a single sitting. The more I’ve learned about energy metabolism, the more confident I am in this advice. The bombarding of the body with high dosage of carbs isn’t something it has much practice dealing with to begin with. But it is made much worse when you manage a strong homeostasis with a low carb diet for a significant period of time before blindsiding it. – I have quite a bit of a backlog now in my findings that I just need to put together. I’m now balancing between that and the actual education effort I have underway with the comics (which are likewise very popular). I just need to clone myself to get more of this done! HI Dave , Great site and fantastic post.. What I find fascinating is that I had heard APOE4′ loved Marathon Sports, were absolutely meticulous about keeping numbers and statistics….. and they love CHEESE… are you a cheese lover. I was involved in ocean paddling marathons which I stopped after my first heart attack, a few seasons after actually, that’s the extreme personality trait that also comes with being an APOE4. After being on Low Carb, and high fat the Cardiac has worsened considerably.. I will let you know if the new diet direction fixes either or both of those. High Omega 3 is built into the diet..
– I’m interested in your story with regard to being ApoE4 and having the heart attack after being LCHF. Can you give a more expanded story of what happened? Also, given the advice you give above, I assume you are likewise going on the oil, seafood and plant-based diet described by Dr Gundry — but it sounds like you’re still early into it. Let us know how that is going as well. I can’t read Russian, my wife can. I posted the wrong portion of the blood test, here’s the first cholesterol test portion, attached. Can the moderator delete the Russian language photo from my previous post, or add this one in its place?